TROY, N.Y. - A previously unseen band of stars beyond the edge of the Milky Way galaxy has been discovered by a team of scientists from Rensselaer Polytechnic Institute, Fermi National Accelerator Laboratory, and the Sloan Digital Sky Survey (SDSS). The discovery could help to explain how the galaxy was assembled 10 billion years ago. This ring around the Milky Way galaxy discovered by the Sloan Digital Sky Survey may be what's left of a collision between our galaxy and a smaller, dwarf galaxy that occurred billions of years ago. It's an indication that at least part of our galaxy was formed by many smaller or dwarf galaxies mixing together, explained investigators Heidi Jo Newberg of Rensselaer Polytechnic Institute and Brian Yanny of the Fermi National Accelerator Laboratory's Experimental Astrophysics Group. For illustration purposes, the sun is approximately 30,000 light years from the center of the galaxy. Traveling from Earth at the speed of light, it would take 40,000 light years to reach the newly-discovered ring of stars. Hidden from view behind stars and gas on the same visual plane as the Milky Way, this ring of stars is approximately 120,000 light years in diameter, says Heidi Newberg, associate professor of physics and astronomy at Rensselaer and a co-lead investigator on the project. 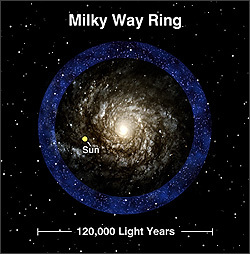 Traveling from Earth at the speed of light, it would take 40,000 light years to reach the ring. "These stars may be what's left of a collision between our galaxy and a smaller, dwarf galaxy that occurred billions of years ago," says Newberg. "It's an indication that at least part of our galaxy was formed by many smaller or dwarf galaxies mixing together." The ring of stars is probably the largest of a series of similar structures being found around the galaxy. Investigators believe that as smaller galaxies are pulled apart, the remnants dissolve into streams of stars around larger galaxies. Gravity, primarily from unseen dark matter, holds the ring in a nearly circular orbit around the Milky Way. "What's new is the position of the star belt on the outskirts of the Milky Way, an ideal position to study the distribution and amount of dark and light mass within the band," said Brian Yanny, a scientist at Fermilab's Experimental Astrophysics Group and a co-lead investigator on the project. Newberg and Yanny presented their findings today at the American Astronomical Society meeting in Seattle, Washington. Evidence of this new unexpected band of stars hidden by the Milky Way comes from multi-color photo imagery of hundreds of square degrees of sky and hundreds of spectroscopic exposures from the Sloan Digital Sky Survey, the largest international collaborative astronomical survey ever undertaken. For four years Newberg, Yanny, and a collaboration of SDSS scientists have been examining the distribution of stars in the Milky Way. At the outer edge of the galaxy in the direction of the constellation Monoceros (the Unicorn) they found tens of thousands of unexpected stars that altered then-standard galactic models. Three-dimensional mapping from the SDSS revealed the excess stars were actually parts of a separate structure outside the Milky Way. "The large area covered by the Sloan Survey and the accuracy of the multi-colored observations has allowed us to revisit some classic questions, questions from 50 to 100 years ago," Yanny said. "What does our Milky Way look like as a whole? How did it form? Did it form in one 'whoosh,' or was it built up slowly via mergers of collapsing dwarf galaxies? And how does the mysterious dark (invisible) matter affect the distribution of stars?" The Sloan Digital Sky Survey will map in detail one-quarter of the entire sky, determining the positions and absolute brightness of 100 million celestial objects. It will also measure the distances to more than a million galaxies and quasars. The Astrophysical Research Consortium (ARC) operates Apache Point Observatory, site of the SDSS telescopes. SDSS is a joint project of The University of Chicago, Fermilab, the Institute for Advanced Study, the Japan Participation Group, The Johns Hopkins University, the Los Alamos National Laboratory, the Max-Planck-Institute for Astronomy (MPIA), the Max-Planck-Institute for Astrophysics (MPA), New Mexico State University, University of Pittsburgh, Princeton University, the United States Naval Observatory, and the University of Washington. Funding for the project has been provided by the Alfred P. Sloan Foundation, the participating institutions, the National Aeronautics and Space Administration, the National Science Foundation, the U.S. Department of Energy, the Japanese Monbukagakusho, and the Max Planck Society. Rensselaer Polytechnic Institute, founded in 1824, is the nation's oldest technological university. The school offers degrees in engineering, the sciences, information technology, architecture, management, and the humanities and social sciences. Rensselaer faculty members are known for preeminence in research conducted in a wide range of research centers that are characterized by strong industry partnerships. The Institute is especially well known for its success in the transfer of technology from the laboratory to the marketplace so that new discoveries and inventions benefit human life, protect the environment, and strengthen economic development.